Three members of the elite Top 100 Agents club explain how they manage referrals, buyers and even other agents in this exclusive Real Estate Business roundtable discussion. Simon Harrison rewards referrers with gifts. Piers van Hamburg uses video on every one of his listings. Warwick Williams generates a quarter of his open home traffic from local papers. Whatever they’re doing, it works, because all three agents made enough sales to qualify for the Top 100 Agents ranking. Every member of the Top 100 Agents club is elite, yet they often employ very different methods. 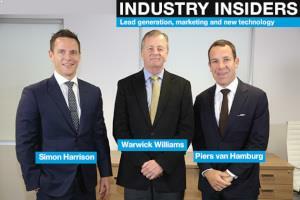 In this exclusive feature, the three agents share some of their day-to-day business practices and also offer their views on some of the industry’s most important issues. How do you market to buyers and sellers? We communicate on a mass basis with buyers, who we categorise into A, B and C. It’s not rocket science: we categorise them by what they’re looking to buy and looking to spend, but also how ready they are to purchase. I’m sure every good agent would have an A list of buyers. These are typically people who bid at auction, but were unsuccessful. They’ve made offers and been unsuccessful; they’re very-ready-to-buy people. That’s generally all phone contact: both me and my team manage that, and we contact them with all our new stock. B and C communication is all automated. We have all the automated alerts. We do a lot of SMSs as well with our B and C groups, which I think is becoming more commonly accepted. We also do a lot of email blasts. But the A list of buyers is key. We don’t try to sell a lot off‑market, but we are selling more off‑market just because buyers know there’s competition out there. Some of our buyers have been in the market for one or two years before they’ve actually bought. They start out as bargain-hunters, then they ask what they have to do to own a place, so they go from one extreme to another. Imagine being in this [Sydney] market for the past year. You would’ve had to have knocked off a bedroom by now. Some of these people aren’t even having building reports done, because they’ve missed out on other places. With vendors, a lot of work goes into working with your pipeline. I’ve gotten to the point now where if I get called out with four agents and there’s no existing relationship, I almost don’t feel like going. I don’t like going out and having to fight because it then comes down to fee. I measure how many uncontested listings I can get into. I think it’s a sign you’re doing a great job if you’re getting out there and they’re not seeing anybody else. How do you know if you’re uncontested? Do you ask? If I can, I will. You’ve got to play it by ear. Often I ask them when I’m signing the agency agreement, but I wish I’d known a little bit earlier. You’re right. When you’ve met them and managed the relationship, you do get the listing the way you want it and you don’t have as much pressure on fees. You get it on your terms, they listen to what you’ve got to say and generally they have a pretty good campaign. Sometimes I find that when they get other agents involved and they over-promise, it can stuff the whole thing up and you have to work to get them back on track. What do you do when another agent has given a potential client a higher valuation? I explain the downsides of not handling it correctly. I show a few case studies of properties that weren’t handled correctly and were overpriced, where I had to come in and rerun the whole campaign. I explain that it’s always harder the second time around. I had one happen yesterday with a couple in their 80s. I said, you have to style it – $8,000. You’ve got to do some work to the property – another $4,000. You’ve got to spend $11,000 on marketing. So they’re almost $25,000 down. Then one of the other local agents is in there saying he’s 10 per cent cheaper on the fee, you don’t need to style the property and you can just put it on the internet. The work you put in before a buyer comes through the door will have a big impact on the outcome. We do a lot of work with clients to get the homes ready so they get a better net outcome. I think you get a 10-fold return on any styling. Spend $5,000 and you’ll easily get $50,000 back on that investment. With rental properties, when you take a photograph of an empty room you get no traction at all. Do you guys do professional photography on your rentals? Yes. The good thing about rentals is that once you’ve done the photography, you keep it on your database and keep reusing them. It’s nice to see a lot of the agencies aren’t treating rentals like they’re a poor cousin. If you go back five years, you’d see professional photos in the sales but you’d have property managers taking photos on their phones. If you ask clients to pay for it they won’t. I end up paying for it, because you can’t have your website showing one good photo and one bad photo. Going back to managing pipelines – what else do you do to nurture your pipeline? I consistently get on the phone with my A and B buyers. I get your newsletter, Piers, and I think it’s one of the best I’ve seen. I get a lot out of it. Sometimes I’ll meet somebody, they’ll fall off the radar, then I’ll get a call a year later and they’ll say they’ve been getting the newsletters. I think the market wrap video you do has a lot to do with that. I think those videos are a nice personal touch. I’ve even seen you doing them in coffee shops. Doing the videos in front of properties can get a little bit boring. Next month, I’m going to a restaurant in Neutral Bay and I’m going to plug that restaurant. The other thing I’m going to do with the videos is they started off at 1.5 or 2 minutes, but now they’ve blown out to 3 minutes, which is far too long, so I’m going to try to get it closer to 1 minute. You need quick grabs, otherwise people don’t have time to watch. Do you do that once per month? About $600 per video. It’s not much at all. I had a good idea the other day about sending videos like that to your database. You grab a small room, spend half a day with the film guys, and come up with 12 topics that you can film one after the other, and you use that on a monthly basis, maybe interspersed with a market report. The videos can be about buying at auctions, getting ready for sale and topics like that. I went to see Marshall White in Melbourne and I showed their video guy some of my videos. He said, “Piers, you need to change them. If you’re saying that you sold this and sold that, all your clients are seeing is you showing off, and all they’re thinking about is how much money you’re making.” So I’m looking for ways to soften the videos. It’s what you were talking about, Simon – value-adding rather than boasting. We made the very brave and bold move to put video on absolutely every listing. You can’t do a listing under our agency and not have video. Rather than have the agents doing the presentations, we employed two full-time presenters – they’re almost like Getaway hosts. It costs between $250 and $800 per listing on top of the web campaign, but it’s been really good for us because that’s the way that it’s going. Digital is the future and it certainly increases our viewing time online. How do you handle referrals? How do you know who to do business with? I won’t hand out a referral unless I’m confident that person is going to do a good job, because if, for example, I give a referral to Simon and he doesn’t do a good job, that reflects poorly on me. I think it works itself out over the years from dealing with people. Most referrals are based on personal contact. I always want to meet new agents, especially independents. When you’re with a network there’s an onus to refer to people within the company, but a lot of independent agents don’t have someone to refer to. About 25 per cent of my business is based on referrals from agents. Yes. But having said that, in my business we share a lot. There’s a lot of sharing of listings. The boundaries have gone. Years ago, you wouldn’t have thought about doing business outside your core area. But now, if I look down where the stock is going, half of our stock is going to outside areas so we’ve now got to look further afield. It’s always harder to sell up [in price]. Given the internet now, you can go anywhere, especially in this market where you’ve got buyers who are searching hard for properties. I’ve got a very spread rent roll, so I might as well use my rising stars to work those areas. Is it ethical to pay for leads? I don’t know what you guys pay for leads, but we pay a 20 per cent referral fee. We pay agent-to-agent fees, but we tend not to pay outside the industry. If people think you’re getting something out of it, it loses its arm’s-length credibility. I send out a lot of gifts, regardless of whether I get the job or not. If someone gives me a referral, I’ll send a gift straight away. I do the same, and I think that’s worth its weight in gold. My gift is always commensurate to the quality of the lead. If it’s a $5 million house, I’ll give them something good! I think it’s all about personal relationships when it comes to referral business. I wouldn’t just pick up the phone and refer business to an agent. New technology comes along all the time, so how do you know which products will be the next big thing and which will just be gimmicks? I’m not a huge tech person. I embrace a couple of things, but they’re not game-changers. We use iPads at our open homes that link back to our database. I remember when Facebook came in, it was going to be the game-changer and if you didn’t have a social presence, forget it – that’s how the Gen Ys were going to buy and sell property. You’ve got to be very careful you don’t get distracted by the new fad. What we do is stick to the basics and don’t get taken off track. The assessment I have is this: is it going to improve some part of the basics? Is it going to help me be more efficient and productive? Technology is always going to be a support for what we do, never a replacement. I’ve seen it over the years, something comes in, a lot of money is spent – and it then disappears. What about QR codes? What a waste of time that was. I think you’ve got to be relevant. From my point of view, not being a big tech guy, I do rely on the Belle franchise to provide direction in that area. The thing I’m hearing a lot about lately is personal agent websites. They’re becoming more and more relevant. I’m hearing a lot of elite agents moving into that space, and putting sales and videos up there. We’re thinking about moving into that space – not for every single agent, but just as a test. We’ve just started doing it since last week. Every team member in sales has their own site. I think the digital space, if done correctly, is somewhere where you can get some traction. That’s not going to get you business, but it might make the difference for the right person. To be relevant to Gen Ys, you’ve got to know your stuff, be relevant, have good information and have a bit of an edge to your brand, including your personal brand. What about Ratemyagent? Do you support that? We’re not on it enough. We need to be on it. However, I look at the people who are most ranked in my suburb and they don’t seem to correlate with [results]. I think they’re making a commitment to it. I go on there and no one has written a review of me, whereas you go to other agents in the area who sell 20 per cent of what I would trade and they’re at the top and have got all these clients talking about them. It’s got traction now. Anyone I sell or buy to, I send them a link and ask them to fill it in – and they do. I’ve then been using it when I talk to prospective vendors. I tell them to get on Ratemyagent and there are lot of reviews for the past six months. So I think it does help. I say to people that it’s like TripAdvisor for real estate agents. But it’s another thing you’ve got to worry about to be relevant. I’ve been looking at the website of BresicWhitney, who operate predominantly in the inner city. They’re dealing with younger and more edgy type of people. If you look at their photography, it’s almost like architectural photography. It’s very artistic. I really like it – I think it’s great. But we couldn’t get away with it in our marketplace because we’ve got a broader marketplace that’s a bit more conservative. If you try to explain to a 70-year-old retired banker that their photos should be kind of out of focus but in focus – it just wouldn’t work. What innovative sales or marketing campaigns have you done? I had a client about three months ago, whose property I’d tried to sell about a year ago. He got me out again with another agent and asked me what I was going to do differently to last time. He said: “I understand you’re going to put it in the paper and on the internet, but I want some ideas outside the box.” I’ve always enjoyed watching Million Dollar Listing, so I thought I’d put on a Million Dollar Listing-style event at his house. I invited all the agents from my office, the local buyer’s agents, a few buyers also, The Sydney Morning Herald and the local paper. The Sydney Morning Herald ended up running a big online story about it, which was good, so we got great PR out of it. About 70 people turned up and it was a huge success. It didn’t find a buyer, but the vendor was really happy about it and gave a testimonial online which we got great PR out of as well. Did you have a traditional marketing campaign wrapped around that? We did. Our first open was on a Saturday, and I ran the event on the Thursday night before the first open house. Print marketing still has power. We got Property of the Week in the North Shore Times for a house that wasn’t going so well. We got the front page and a full-page editorial on the inside cover and two buyers came and fought it out in the last week of the campaign. Print still works. I’ve tried to do a few without [my local paper] and it just leaves a gap. It’s quite noticeable, even in terms of energy. People might turn up who aren’t buyers, so for the buyers who are there they see your traffic flow is much higher. I think you want to be able to turn around on auction day or whenever the decision-making time is and say you’ve done everything. At open-for-inspections, we ask people where they’ve seen the property. I would say 20 or 30 per cent of interest comes from local papers. The print will attract the buyer who sometimes doesn’t know they’re a buyer. They’re flicking through and think that something’s nice, although then generally they go online to get all the other info. We’ve all sold houses to people who saw something in print and weren’t even thinking of moving. How do you deal with the perception that some people have that agents are unethical? In my area, 95 per cent of the agents are good people doing good business. In the market we operate in, we have a very educated client and they see through shonks pretty quickly. We all know the ones who quote very low – they’re the ones who are always in trouble with Fair Trading. But with a lot of buyers, if you say it’s going to be $1 million, they get used to $1 million meaning $1.3 million whereas we might mean that it means $1 million to $1.1 million, and they don’t bother turning up [for the auction]. The other thing that really upsets people is if it’s sold prior to auction and they’re left out of the loop. They’ve said they’re interested, but the agent deals with a buyer without keeping them in the frame for a negotiation. That’s misconduct, isn’t it? You’re not doing the right thing for your vendor. The standard has improved over the years, even if there are still a few cowboys. When I started in real estate, the old agents used to put superglue in your locks and steal your boards. What should agents be doing to retain the confidence of buyers? You have to keep them up-to-date and be transparent with where the market’s at. I think when the market turns down, agents suddenly think they need to look after buyers now. The mantra we’ve got in our business is that they’re gold in this marketplace – in fact, they’re gold in any marketplace. They’re future vendors too, aren’t they? Last year, just under 25 per cent of the properties I sold bought off me. I think the opportunity to manage buyers effectively to get those outstanding prices is the key. We mass-communicate with every buyer three times throughout an auction campaign. You look at America, where they get 6-7 per cent commissions – they have specialist buyer’s agents and specialist listing agents, so the buyers get looked after. Our fees are so competitive that a lot of the energy has to go into the vendor because that’s the person who has stumped up the money for the marketing and appointed you. We’re limited in our resources, but if you’ve got the scale to have a full-time person in your team who’s a buyer’s agent – that’s the ideal. They do get neglected a bit just because we’re under-resourced. The industry has changed a lot in my time. It used to be that if you wrote $450,000 you were a rock star. Then all of a sudden people started writing $700,000 or $750,000, then all of a sudden people starting getting PAs. Now it’s all about teams. If you look at those juggernauts in every market, they’ve all got at least two or three people in their business; some have more. That’s when you can provide the service of managing buyers a lot more effectively. So it must be hard to compete being a standalone agent these days. Everyone starts off that way, but you need to prove you can get up to $300,000 or $400,000 on your own then make that investment. How can mainstream, English-speaking agents cash in on the growing Asian overseas investor market? The office I’ve got at Wentworth Point was a joint venture with a developer who was developing out there. They’re building all over Sydney at the moment. They’re being sold through a network – almost like an Amway for real estate – who provide these buyers and they allocate them off to different groups. I’ve had two sales [in the first five months of this year] to mainland Chinese buyers who don’t speak a word of English. What’s been great is that McGrath have set up a China desk. A buyer walks into an open house who doesn’t speak a word of English, I call our Chinese specialist, he translates between ourselves and the buyer, he’ll come out and meet the buyer, he’ll come to an auction and bid for them if necessary, and he then handles that relationship. There are two sales I don’t think I would’ve gotten if I didn’t have that Chinese specialist. I sold two houses last year with no China desk. The client was Chinese and the buyer was Chinese. Do you think in some of those areas like Alexandria, Lane Cove and Parramatta where all this massive development is happening, will there be an oversupply from a rental perspective? There already is. We’re re-letting some apartments in new buildings where we were getting $580 but are now getting $520. What about selling – have some of the prices gone backwards? They’ve gone up again. There’s still demand on the buying front, no question. Are any of you facing any particular challenges at the moment? Nothing is keeping me awake at night. I don’t think this is the best market I’ve been in – I know it is. How are you going with recruitment? We’ve got a great team at the moment and we’re not actively looking for anyone. We’re very careful about who we take on.